Potatoes come in red, white, yellow and even blue and purple, with many varieties of each. 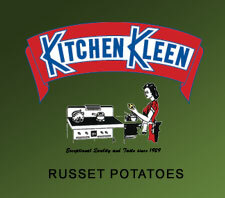 Kitchen Kleen Potatoes are always prime Russet Burbank potatoes, a high quality variety of white potato. While Russet Burbank potatoes are hard to grow, they are a high quality potato that tastes great and has many uses. Russets are the most widely used potato in the USA, a large majority of which are grown in the Northwest. Russets have netted brown skin and white flesh that turns fluffy when cooked. Russets are all-purpose potatoes for baking, roasting, mashing and frying. They are available year-round. Some major varieties are the Burbank, Centennial, Norgold, Norkotah, Ranger. The developer of the Burbank potato, Luther Burbank, was an American botanist, horticulturist and a pioneer in agricultural science. He developed more than 800 strains and varieties of plants over his 55-year career. He developed the Burbank potato in Lunenburg, Massachusetts, in the early 1870s. In 1875, Burbank sold his farm and the rights to his potato, and moved to Santa Rosa, California. A natural genetic variant of the Burbank potato with russet-colored skin later became known as the Russet Burbank potato. This large, brown-skinned, white-fleshed potato has become the world's predominant potato in food processing. Whenever you buy Kitchen Kleen Potatoes the taste, texture and cook times will always be the same and consistent because of the fact that we do not switch varieties. We have experimented with other varieties of the Russet, and cannot find anything that has come close to the Russet Burbank for quality and consistency. Sometimes you can buy a brand of potatoes in the grocery store and they will cook and taste one way and the next week when you buy the same brand of potato it will cook and taste differently because it is a different variety of Russet in the bag. So remember that Kitchen Kleen Potatoes will always have that consistent taste and texture that's important to every recipe. Inca Indians in Peru were the first to cultivate potatoes in about 200 BC. In 1536 Spanish Conquistadors conquered Peru, became aware of the potato, and carried them to Europe. Before the end of the sixteenth century families of Basque sailors began to cultivate potatoes along the Biscay coast of northern Spain. Sir Walter Raleigh introduced potatoes to Ireland in 1589 near Cork on the 40,000 acres of land given to him by Queen Elizabeth I in 1581. Potatoes arrived in the Colonies in 1621 when the Governor of Bermuda, Nathaniel Butler, sent two large cedar chests containing potatoes and other vegetables to Governor Francis Wyatt of Virginia at Jamestown. The first permanent potato patches in North America were established in 1719, most likely near Londonderry (Derry), NH. A. A. Parmentier helped King Louis XIV popularize the potato in France in the 18th century. Parmentier created a feast with only potato dishes, a concept he realized was possible while being imprisoned in Germany and fed only potatoes. Benjamin Franklin, ambassador to France, was in attendance of Parmentier's feast in 1767. Marie Antoinette, wife of Louis XV, was known to wear potato blossoms as a hair decoration. Over the years of cultivation in Ireland, the potato had become the major food source to the Irish population. In 1845-46 a fungus destroyed the potato crops causing the disaster of the Irish Potato Famine. On the South Atlantic Island of Tristan de Cunha, potatoes were once used as the country's unofficial currency. Because of it's remoteness, food was most valuable. - Raw slices placed on broken bones to promote healing. - Eaten with other foods to prevent indigestion. - Measured time: by correlating units of time by how long it took for potatoes to cook. French chemist Louis Lumiere used microscopic grains of potato starch fixed on 9-inch by 12-inch glass plates to create and market the first autochromes in 1907. Autochromes were widely used in photography before the development of color film. - Treat facial blemishes by washing you face daily with cool potato juice. - Treat frostbite or sunburn by applying raw grated potato or potato juice to the affected area. - Help a toothache by carrying a potato in your pocket. - Ease a sore throat by putting a slice of baked potato in a stocking and tying it around your throat. - Ease aches and pains by rubbing the affected area with the water potatoes have been boiled in. Some of the most famous potato dishes we enjoy today were created by mistake Collinet, chef for French King Louis Phillipe (reign 1830-1848) unintentionally created soufflés (or puffed) potatoes by plunging already fried potatoes into extremely hot oil to reheat them when the King arrived late for dinner one night. To the chef's surprise and the king's delight, the potatoes puffed up like little balloons. In 1853 railroad magnate Commodore Cornelius Vanderbilt complained that his potatoes were cut too thick and sent them back to the kitchen at a fashionable resort in Saratoga Springs, NY. To spite his haughty guest, Chef George Crum sliced some potatoes paper thin, fried them in hot oil, salted and served them. To everyone's surprise, Vanderbilt loved his "Saratoga Crunch Chips," and potato chips have been popular ever since.